Max. 3 rods per angler at any time. No unattended rods. Min 15lb line - no braided mainlines. No bent hooks. Micro barbed hooks only. No fixed rigs of any kind. No lead core or other types of leader. Injured fish to be treated with Klinix or similar. All fish to be treated with care and returned to lake ASAP. A good quality unhooking mat or cradle that suits the size and weight of the fish muts be used at all times. Under no circumstances will sacking of fish be allowed. 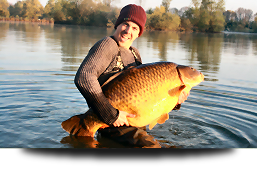 Bait boats can be used with due consideration to other anglers. No BBQs or fires. Gas or petrol stoves are OK if used with care. All rubbish to be bagged including *cigarette ends* & *bottle tops*. On site toilets must be used. Excessive rowdy or inappropriate behavior will not be tolerated. Fishing closes at 10am Saturday and starts again at 1pm on a Saturday. 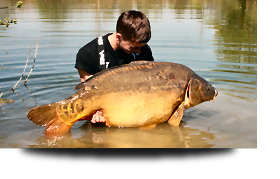 The only baits allowed will be fresh or frozen boilies, maize and carp pellets. (Maize and pellets can be bought on site). No other particles or nuts of any kind are allowed.